The National Academy of Sciences predicts that the ocean along California’s coast will rise as much as one foot by 2050 and five feet by the end of the century. 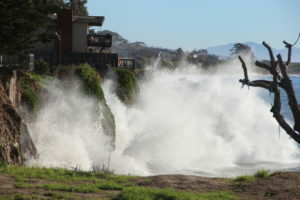 To help document the potential impacts of rising sea levels, Channelkeeper and other groups throughout California coordinate efforts to support the California King Tides Project. These winter high tides, known as “king tides,” are the highest tides of the year. Although king tides are naturally occurring and predictable, they are particularly high compared to tides throughout the rest of the year and thus offer an opportunity to see how infrastructure and ecosystems may be impacted as sea level rises due to climate change. When king tides occur during storms, large wave events, or floods, waters can rise to even higher levels and have the potential to cause significant damage to property and the coastline. During king tide events (generally in December and January), Channelkeeper seeks volunteers to help photo-document our shoreline. Channelkeeper also documents king tides by boat and by air. Open the SBCK King Tides Google Map or use the map below to view pictures taken by Channelkeeper and volunteers during King Tides. 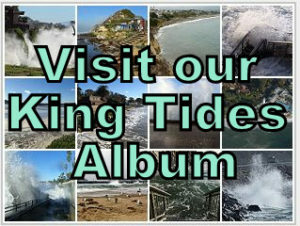 You can also visit our Flickr SBCK King Tides photo album. Head to our local beaches for the morning high tides on December 22-23 and January 20-21 to document impacts to sensitive habitats and infrastructure (buildings, outfalls, sea walls, piers, etc.). Send your pictures to molly@sbck.org and post to social media using #kingtides. Click here for more information on King Tides.